The hard-boiled egg on the breakfast burger was a big disappointment. Hintonburger, the neighbourhood joint with a loyal following, recently began serving breakfast on weekdays, starting at 6:30 a.m. I decided to check it out. When I called to see what was on the menu, the guy on the other end of the phone said they offer a breakfast burger in addition to a breakfast sandwich (essentially a BLT with egg and cheese). He said he also had a couple of crepes left and if I wanted one of the breakfast sandwiches he’d have to start cooking some more eggs. Isn’t this the beloved place with the tagline: “fresh, local and handmade”? Surely, the eggs are made-to-order. And a crepe made at 6 a.m. wouldn’t be served at 10, would it? I told the guy I’d be by in about an hour. When I arrived, I was the only customer in the place. I ordered the breakfast burger — which the menu describes as a 3 oz beef patty on a bun with egg, real Canadian cheese, local maple-smoked bacon, fresh lettuce, and tomato. When I took the first bite, I discovered not fried egg, not poached egg, not scrambled, but a few slices of hard-boiled egg. For me, a fresh handmade breakfast sandwich must be made with a freshly-cracked egg. Cold disks of egg are an insult. Then I noticed the bacon seemed flabby: was it re-warmed? The cheese beneath the burger was barely melted, which made me question the freshness of the patty. Why don’t I smell any food cooking on the grill? Was this made in the basement? I had asked for a cup of coffee but was deterred by what seemed like reluctance on the employee’s part to brew up a fresh pot. I told him to forget it. Sitting in a booth inside the empty former KFC, looking out the window at the blowing snow, I began to meditate on this term “fresh,” a word that is a used to describe almost everything we eat: the philosophy of every restaurant, every loaf of bread in its cellophane bag, every slippery slice of luncheon meat at the supermarket. Its meaning is lost. Or at least open to vast interpretation. It has become the container into which we place our desires. I took one sip and tossed the bitter brew — and the burger — in the trash. 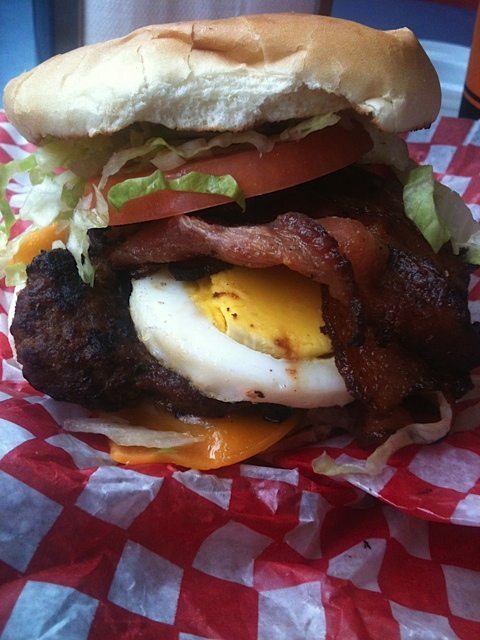 Breakfast hours: Monday to Friday 6:30 a.m. – 11 a.m.
Hintonburger, 1096 Wellington St., 613-724-4676.